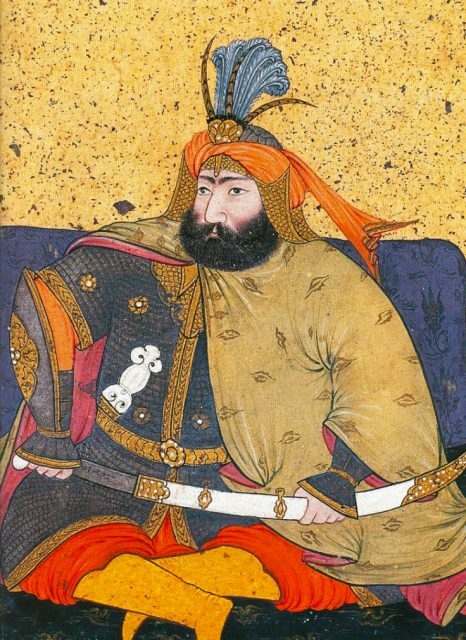 So, Murad the IV was the Ottoman Emperor in the first half of 17th century, being contemporary to the 30 Years' War. I mainly wanted to show this portray, for you can see the use of latten and what appears to be pearls in the mail and in the rerebrace. Also, to ask you if there is any evidence for Islamic armor being completely hidden by dresses (I'm excluding Khazagand/Jazerant mail-cloth armor), for when I read Heath's Armies of Middle Ages he said the thesis of undergarment armor was debunked by the time he wrote his book (1970-80's). Murad's armor is obviously not hidden, but it's an interesting match anyways. I'm excluding Khazagand/Jazerant mail-cloth armor), for when I read Heath's Armies of Middle Ages he said the thesis of undergarment armor was debunked by the time he wrote his book (1970-80's). We do have European wills and household accounts which mention such clothing though. If my memory serves me right the Howard household accounts mention the use of mail and red velvet in a single garment. Pedro, take a good look at the painting of Murad, his hauberk IS obviously hidden by his clothing, the painter shows his clothing thrown back to one side which exposes his hauberk. This was not uncommon, when looking at paintings done of Indo-Persian warriors you often see helmets and arm guards but not hauberks or other body armor, what you see instead are long coats. "Salah Al din (Saladin) stood in his place until a part of the army joined him. He then said, "Put on your armor". The majority of those did so while I remained standing by his side. After a while he said again, 'How many times do I have to say "Put on your Armor?'' I said 'Oh my Lord, surely thou does not mean me?' 'Surely' said he. I replied 'By Allah, surely I cannot put on anything more. We are in the early part of the night, and my quilted jerkin (kuzaghand) is furnished with two coats of mail, one on top of the other. As soon as I see the enemy I shall put it on.' Salah al Din did not reply, and we set off. I'm excluding Khazagand/Jazerant mail-cloth armour), for when I read Heath's Armies of Middle Ages he said the thesis of undergarment armour was debunked by the time he wrote his book (1970-80's). Could you quote the passage or post a link about these accounts? Pedro, take a good look at the painting of Murad, his hauberk IS obviously hidden by his clothing, the painter shows his clothing thrown back to one side which exposes his hauberk. This was not uncommon when looking at paintings done of Indo-Persian warriors you often see helmets and arm guards but not hauberks or other body armour, what you see instead are long coats. What exactly is the sense of having a gilt/latten decored mail shirt with pearls and then hiding it over a mantle? You made a point, but I'm curious about this, anyways. Also: can we consider this coats to be jazerants instead of simply vestments over actually separated armour?